Christmastime is magical. Gleaming lights flicker and illuminate the night sky like stars twinkling pugnaciously to capture our attention. Fir trees are spotted on the rooftops of cars, silently nestled in their orange, netted jackets, just waiting to be adored and adorned. Fireplaces and kitchen stoves become a gathering place of comfort and conversation with loves ones. Mistletoe hangs innocently under every doorway, blushing at the thought of couples stealing a kiss right under its nose. Then, there is solace under the twinkling stars while cradling a piping hot mug of chocolate topped with a shamelessly melting homemade marshmallow. Making homemade candies during the holidays is a great pleasure of mine. These marshmallows are particularly wonderful. 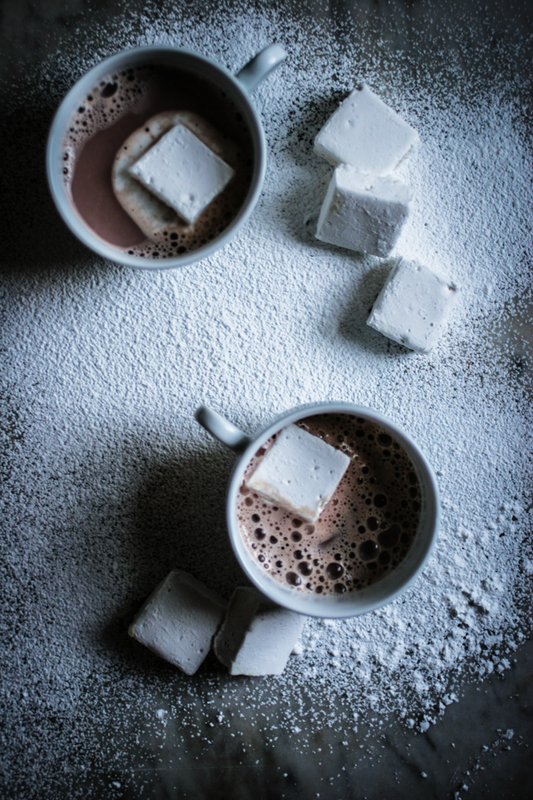 The sound of the sugar and syrup boiling in the saucepan sounds like the pinging crackle of snowflakes hitting the ground, and the texture of the dusted, springy marshmallows remind me of a perfect blanket of freshly fallen snow. Mostly, I adore making these because I love hot chocolate, and these little beaming beauties are like the lights on the tree and the warmth of the hearth, they are the perfect crowning glory to a season of childlike wonder, pure happiness and eternal bliss. May God bless your homes and hearts this holiday season! Note: Serve these wonderfully springy marshmallows with your favorite hot chocolate, sandwich them in between chocolate and graham crackers for luscious s’mores, or package up in cellophane bags as Christmas favors for guests to bring home and indulge in later. Line a 13x9x2-inch pan (or a 8×8-inch pan for taller, cubed marshmallows) with parchment paper. Lightly coat parchment paper with nonstick spray. Pour ¼ cup of cold water and ¼ cup cold bourbon into the bowl of a heavy-duty mixer fitted with the whisk attachment. Sprinkle gelatin over water and bourbon. Let stand until gelatin softens and absorbs liquid, at least 15 minutes. Combine 2 cups of sugar, corn syrup, salt and remaining ½ cup of water in a medium saucepan. Stir over medium to medium-low heat until sugar dissolves. Attach a candy thermometer to the side of the pan. Increase heat and bring syrup to a boil. Boil, without stirring, until syrup reaches 240 degrees, about 8 minutes. With the mixer running at low speed, slowly pour hot syrup into gelatin mixture in a thin stream down the side of the bowl. Gradually increase the speed to high and beat until mixture is thick and stiff, about 15 minutes. Add vanilla and beat for 30 seconds. Quickly scrape the mixture into prepared pan. Smooth the top with wet offset spatula. Let stand uncovered at room temperature for at least 4 hours or overnight. Stir cornstarch and powdered sugar together in a small bowl to blend. Sift a generous dusting of starch-sugar mixture onto a work surface, forming a rectangle slightly larger than your pan. Turn marshmallow slab onto the starch-sugar mixture and peel parchment off of the slab. Sift more starch-sugar over slab. Coat large knife with nonstick spray and cut marshmallows into squares. Toss each in remaining starch-sugar mixture to coat. Transfer marshmallows to a rack, shaking off excess mixture. Marshmallows can be made two weeks ahead, kept in an airtight container with parchment paper in between the layers of marshmallows. I’ve discovered marshmallows two years ago and since then they’re always in my hot chocolate. It will be great to make my own. I love marshmallows! I’ve always bought the prepackaged ones, but these homemade ones are completely different. They are springy, sticky and they melt into your hot chocolate, unlike the packaged ones that stick to the bottom of the mug! I’m so happy I found your blog, Amber! It is gorgeous. Beautiful photography and writing. I’m eager to learn more about Southern food and way of life. Thank you so much for the kind words! I adore sharing my love for the South with the rest of the world! It’s such a blessing! Wishing you the warmest of holiday greetings as well! Great recipe, great pictures! Love!